(Dan Trimmer, 1998). 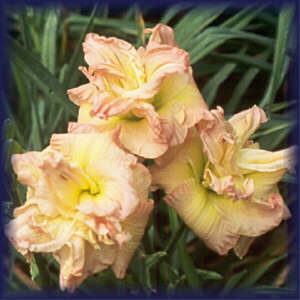 Diploid (ALMOND PUFF X FRANCIS JOINER) When Pat and her sister seedling KATHY ROOD first bloomed I was thrilled. This is the only time I have ever redone a successful cross due to the quality of the first batch. PAT NEUMANN and her sisters are the finest large doubles I have grown in my garden. Pat is a very large 6” consistent informal double with round full petals and a profusion of rounded petaloids that glow pink and cream and chartreuse. 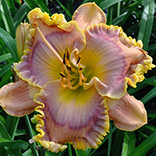 Face on, about half of the bloom is an extension of the green and chartreuse throat, creating the effect several flavors of sherbet having been blended but barely mixed. In Florida scapes just kept reoccurring, and flower size increased with each new bloom set. Established plants display deep branching and an occasional proliferation on there lowest bract. Foliage is compact and the plants are vigorous. Registered as a dormant Pat behaved as a Semi-evergreen in Florida. Named for Long Island’s Pat Neumann who first informed me she had to have that plant!